The latest friction with Serbia over a train has revived calls in Kosovo for a boycott of Serbian products - but shops that do not stock Serbian goods remain few and far between. Read more. The preconditions set by the ethnic Albanian parties on language rights and other issues will make the work of forming a new coalition government in Macedonia especially complex. Read more. Photojournalist Ron Haviv’s shocking image of a Serbian paramilitary kicking a woman’s corpse during the Bosnian war is one of the subjects of a forthcoming documentary about his most significant pictures. Read the full interview. The presence of Bosnian-American Ayla Heder at the women's march in Washington on Sunday has caught the attention of Bosnian and international media. Today, employees from Bosnia's state broadcaster BHRT are protesting to demand a resolution to its dire financial situation. The Independent Trade Union of Workers of BHRT will hold a protest at 12.05pm, demanding a resolution to BHRT's finances within 60 days. "As a representative union of BHRT, we announce protests over the threats to the existence of all the workers and their families, which is the product of the catastrophic financial situation we are in. "Payment of wages of workers are in question, all contributions are not being regularly paid, the working conditions are catastrophic, and the facilities are out of date," the union said in a statement on its website. “[US photographer] Ron Haviv’s 1992 picture of a Serbian paramilitary fighter kicking the lifeless body of a middle-aged woman who his comrades had killed just moments earlier may not have changed the course of the Bosnian war like Nick Ut’s famous photograph of a naked Vietnamese girl running away after a napalm attack in her village. Read Igor Spaic’s full story on Ron Haviv’s new documentary on capturing the image of ethnic cleansing in Bosnia. 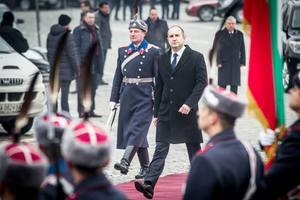 Bulgaria’s new President, former air-force chief Rumen Radev, has begun his first working day as premier today after he was officially inaugurated on Sunday. Radev is expected to present his new administration on Monday, as well as to dissolve the parliament and appoint a new caretaker government by the end of the week. During his inauguration speech on Monday, Radev promised to be a “President of all Bulgarian citizens, a President of dialogue and reconciliation, of cooperation and balance”. An 18-year-old Austrian citizen of Albanian origin remains under police interrogation after he was arrested on Saturday for his alleged involvement in terror activities. Following the arrest, Austrian interior minister Wolfgang Sobotka claimed that the move had averted a potential terrorist attack from taking place in Vienna. Austrian media have reported that it remains unclear whether the arrested person, Lorenc K, poses a threat, claiming that there is a lack of evidence against him. Czech citizen Vit Jedlicka, a founder of the self-proclaimed statelet Liberland, which comprises 7 square kilometres of disputed land between Croatia and Serbia, told the Washington Post on Monday that he expects the new US President Donald Trump to recognise the statelet. Jedlicka stated that having Trump, who he has previously claimed to have good relations with, as US President 'opens new doors' for Liberland. He also claimed that he and 20 other Trump supporters from the self-proclaimed statelet attended Trump’s inauguration in Washington on Friday. Jedlicka and his associates declared Liberland to be a statelet in April 2015, claiming to have the right to declare an independent country on no man's land according to the international law. Serbia's mission to the UN in New York, with assistance from the Serbian and Jewish academic societies as well as Bosnian film director Emir Kusturica and Israeli Holocaust expert Gideon Greif, are organising an exhibition in the US state of New Jersey to mark the 75th anniversary of the opening of Jasenovac concentration camp in central Croatia. The exhibition will be open from Thursday to Monday, during which time Serbia's mission to the UN has also organised for numerous memorial ceremonies for the victims of the camp to take place. Speaking at the 75th anniversary commemoration of the WWII raid on the northern Serbian city of Novi Sad, during which Hungarian troops massacred Serbs, Jews and Roma, Serbian President Tomislav Nikolic called for an institution dedicated to the “memory of victims” and for “repression” to be bound in law as the official terms to be used when referring to the "extermination of the Serbian people". 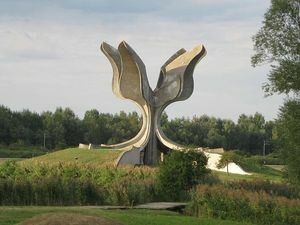 According to Nikolic, a unique memorial complex should be created for the “memory of all the innocent victims who have died in an attempt to exterminate the entire Serbian nation, Jews, Roma and other brotherly nations in this region in the First and Second World War," N1 television network reported. Nikolic added that he will advocate for the concept of "repression" to be included in Serbia’s legal system to refer to the suffering of Serbs in the same way that “Holocaust" refers to the suffering of Jews during the Second World War. "The Serbian nation, in proportion to the population, certainly belongs to the peoples who have suffered the most in the history of mankind,” Nikolic said. “[The term] 'Repression' is to describe an attempt to exterminate the Serbian people during the First World War, but also during the fascist regime in Germany and by the fascist Independent State of Croatia." Former Kosovo premier and ex-Kosovo Liberation Army commander, Ramush Haradinaj, who is currently in France awaiting a decision on whether he will be extradited to Serbia to face war crimes charges, has criticised the decision of Kosovo’s President, Hashim Thaci, and current Prime Minister Isa Mustafa to meet with Serb representatives in Brussels tomorrow. “To sit at a negotiating table with Serbia, who is causing all these damages to Kosovo, even through the recent attacks, such as the wall [in the ethnically divided northern Kosovo city of Mitrovica], train [sent from Belgrade to Kosovo covered in nationalist phrases] and the fabricated warrants [the alleges were made against him and other Kosovo Liberation Army member], means not to understand your state’s interest,” Haradinaj wrote on Facebook. High officials from Kosovo and Serbia, including the Presidents of both countries, will meet in Brussels on Tuesday for the next round of talks aimed at normalizing relations between them. Newly available CIA documents show that America's top spy agency had its hands full following Yugoslavia's turbulent existence and eventual bloody collapse. Read more. Turkey has scrapped a bilateral diploma acceptance deal with Macedonia after the authorities in Skopje failed to close schools and organisations suspected of links to alleged coup plotter Fethullah Gulen. Read more. After a bruising 2016, the test for Bosnian leaders in 2017 will be overcoming their differences on reforms, steering the economy towards recovery – while resisting the divisive force of nationalist politics. Read more. Macedonia's junior ruling Democratic Union for Integration, DUI, denied that it had reached a deal with the ruling VMRO DPMNE party for the formation of a new coalition government, after unverified information that the two parties had agreed on the DUI's key demands at a meeting on Monday was allegedly leaked to the media. "None of the unofficial information in the media is true. Our [DUI] leader Ali Ahmeti said that any deal will be transparent and that the public will be informed about it,” the party said. The Greek Minister of Defence, Panos Kammenos, called on Monday for severe punishment to be handed down to the seven Greek soldiers of Albanian origin who were photographed making the eagle sign of the Albanian flag with their hands. The soldiers, whose photograph was widely circulated on social media over the weekend, showed disrespect for the Greek army through their actions, Kammenos claimed. According to Greek media, the soldiers risk going to prison over the incident. The Appeals Court in Pristina on Tuesday rejected an appeal by urologist Lutfi Dervishi, the main defendant in the ‘Medicus’ organ-trafficking case, against his custody remand. Dervishi is awaiting retrial for alleged involvement in an organ-trafficking ring that operated from the Kosovo clinic in 2008; he was on the run but was arrested on January 10. He had been sentenced to eight years in jail but the Supreme Court ordered a retrial last month on the basis of procedural irregularities. Dervishi’s lawyer Valon Hasani told BIRN that he will now appeal to the Supreme Court to overturn the custody remand. Bulgarian citizen Mariana Kotzeva became Eurostat’s new Acting Director-General as of January 1 this year, the EU’s statistics agency announced on Tuesday. Kotzeva, an ex-Head of Bulgaria’s National Statistics Institute, joined Eurostat as a special adviser in April 2012. She held a number of high-level consulting posts in the Bulgarian and foreign administrations and led international projects for the United Nations and the World Bank, Eurostat informs. 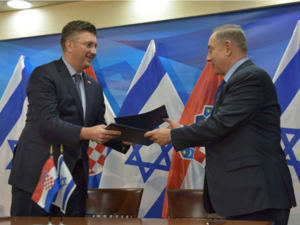 During the Croatian Prime Minister Andrej Plenkovic’s visit to Jerusalem on Tuesday, his Israeli counterpart, Benjamin Netanyahu, said that mutual relations between their two countries improved in recent years and thanked Croatia for supporting Israel in the EU and UN. Plenkovic stated that further dialogue between the two countries will be needed to help resolve the issue of instability of Southeastern Europe, "especially Croatia's neighbourhood". Netanyahu concluded that fighting militant Islamist terrorism, as well as creating balance and stability on the international level, is their "common goal" so that both countries can prosper. The two prime ministers signed a statement pledging to bring closer ties between their countries in preventing catastrophes and reacting to emergency situations. Bulgarian director Theodor Ushev’s film titled “Blind Vaysha” has been nominated for an Oscar for Best Animated Short Film, the Academy announced on Tuesday. The short animation, directed by the Bulgaria who lives and work in Canada, is based on a story of Bulgaria’s award- winning writer Georgi Gospodinov. The 89th Academy Awards which will take place on February 26 in Los Angeles. Prior to a high-level meeting between the most senior officials from Kosovo and Serbia in Brussels tonight, Serbian Prime Minister Aleksandar Vucic claimed that it is obvious that someone doesn't want the continuation of dialogue between Belgrade and Pristina, without specifying exactly who he was referring to, and said that recognition of Kosovo or withdrawal of indictments will not be the topic of today's dialogue. According to Vucic, the use of weapons in northern Kosovo is a more important topic, referring to Serbia’s claims that Kosovo authorities planned to attack a train sent from Belgrade covered in nationalist phrases. Also on Tuesday, Kosovo President Hashim Thaci stated that relations between the two countries are “waiting for difficult days” and that "political and civil mobilization” is needed in his country to show opposition to recent incidents which have increased tensions between the two countries. Thaci added that the Kosovo delegation in Brussels will not allow Kosovo’s sovereignty and territorial integrity to be called into question. 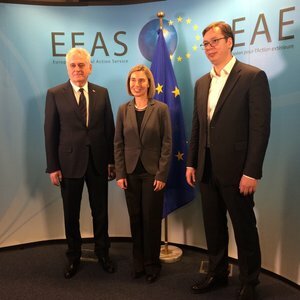 European Commission spokesperson Maja Kocijancic said that the meeting will follow a specific agenda and include discussions on important issues for the region, namely the normalisation of relations between Belgrade and Pristina. Amid heightened tensions between the two counties in recent weeks, "it is important to reaffirm commitments and obligations of both parties to the dialogue," Kocijancic said. She added that it is important to implement all arrangements from the Brussels agreement and said that the talks are not only important for the two sides directly involved, but also for the region and the EU. Chairman of the Presidency of Bosnia and Herzegovina, Mladen Ivanic, on Tuesday attended a hearing held by the state prosecution concerning his connection with holding a referendum in Republika Srpska about a disputed holiday, which the country's Constitutional Court had ruled unconstitutional. "I was summoned as a suspect to comment one of my political statements. I did not want to give comments on my political statements because I am suspected as an accessory. I consider that political statements are political statements, and therefore I didn't make a defense and I didn't want to comment on it,” Ivanic told media after the hearing, emphasising that he did wish to talk about the details. 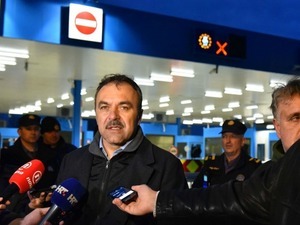 The prosecutor's office also summoned Zeljka Cvijanovic, the prime minister of Republika Srpska, and Mirko Sarovic, minister of trade and economic relations in the Bosnian Council of Ministers. Milorad Dodik, president of the RS, gave his statement to the prosecution at the end of last year. The Turkish deputy parliamentary speaker Ahmet Aydin has called for Bosnia to hand over all of the schools it claims are associated with Fetullah Gulen, the cleric they claim was behind the failed coup in Turkey in July 2016. Aydin made the demand at a banquet attended by the president of Bosnia and Herzegovina's House of Representatives, Sefik Dzaferovic, in the Turkish capital Ankara. “Our primary expectation to achieve a tangible result is to transfer the educational institutions affiliated to FETO (Fetullah Terrorist Organization) to the Maarif Foundation as soon as possible,” said Aydin. His comments are believed to refer to schools run by the Bosna Sema organisation, which runs about 14 schools in Bosnia and has strongly denied any link to terrorism. Bosna Sema is owned privately by a US-based company. 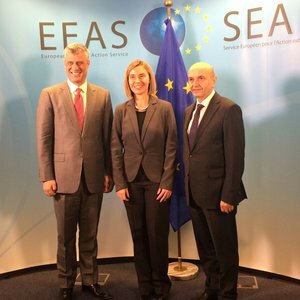 The Presidents and Prime Ministers of Serbia and Kosovo “agreed to leave the tensions behind and to focus on the work ahead,” EU foreign affairs chief Federica Mogherini said in a statement following the high level meeting in Brussels. “Both sides agreed to take the Dialogue forward in a spirit of respect, cooperation and mutual understanding. Discussions between the sides will intensify over the next days. We decided to have a series of rounds of the high level Dialogue, starting from the coming days,” Mogherini said. “Advancing in the Dialogue is key for both sides in moving forward on their respective paths towards the European Union. “I am encouraged by the leadership, vision, commitment and engagement shown by the political leaders today to address and solve issues of mutual concern through the Dialogue,” said Mogherini. Watchdog organisation Transparency International's latest annual report on perceived corruption around the world indicates that a high level of graft persists in Balkan states. Read more. Publicity-hungry migrant hunters are a symptom of bigger problems in Eastern Europe. Read more. The percentage of non-medics working in Bosnian hospitals is too high and is suffocating the health sector, experts warn. Read more. Former Croatian President Stjepan Mesic on Tuesday evening admitted he made “unsubstantiated allegations” and apologised after videos from 1992 were published showing him downplaying the crimes committed at the World War II fascist concentration camp at Jasenovac. “In the circumstances of the political environment [in 1992] in which I actively participated… and under the influence of inaccurate information that I received, there was this reckless statement,” Mesic said. He explained that he was under the influence of the governing centre-right Croatian Democratic Union, HDZ at the time, but by 1994 had made it clear that he disagreed with such views. “If I offended someone with my reckless statement, I hereby apologise,” he said. Croatia’s Minister of Interior, Vlaho Orepic, has rejected allegations from Human Rights Watch and other NGOs that Croatian police are beating and stealing from migrants. In an interview with private Nova TV station, Orepic claimed that he did not have information on such events and called for the NGOs to provide evidence of the occurrences so they can solve the issues together. Orepic also said that migrants are avoiding seeking asylum in Croatia because of fears they would be unable to continue their journeys to other EU countries as they would be deported back to Croatia, where he claims they do not want to stay. Efraim Zuroff, the chief Nazi-hunter at the Simon Wiesenthal Centre, criticised Israeli Prime Minister Benjamin Netanyahu for not mentioning "Croatian Holocaust revisionism" during the public part of his discussion with Croatian Prime Minister Andrej Plenkovic on Tuesday, the Israeli Jewish Telegraphic Agency reported. Zuroff said that Israel was "abdicating its duty" towards Holocaust survivors and urged the administration “to express its concern over Holocaust revisionism and abuse of Holocaust memory without necessarily harming bilateral ties” during its discussions with Eastern European states. He was referring to last week's cancellation of an exhibition on Holocaust victims and diarist Anne Frank at a high school in Croatia and the decision of the Jewish community in Croatia to boycott the state's Holocaust commemorations, claiming the government is not tackling attempts by right-wingers to distort the country’s WWII history. 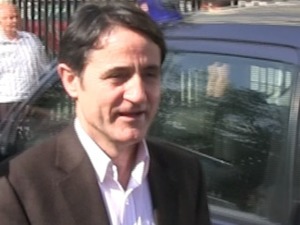 Serbian far-right activist Misa Vacic, a former member of far-right movement 1389, has been fired from his position as an advisor at the Serbian government’s Kosovo office for allegedly violating his work discipline after he took part in the morning programme on the N1 television network, the director of the office, Marko Djuric, announced. Vacic has been employed in Serbia’s office for Kosovo for a few months despite the fact that he has a long criminal record and has previously been sentenced to a conditional penalty. After initially denying that Vacic had worked at the office, Djuric confirmed on Wednesday that the former advisor had been working there on a service contract. In December, Vacic had charges filed against her for allegedly threatening Jelena Pajovic van Reenen, an activist from Civil Society House Endowment, over a mural that was painted on a wall in Belgrade. Serbia’s office for Kosovo has not made any comment in response to these allegations. The first hearing in the trial of activists from the opposition Vetevendosje (Self-Determination) party, charged with attacking parliament by throwing an explosive device at the building in August 2016, was held on Wednesday at Pristina’s Basic Court. Atdhe Arifi, Egzon Haliti, Adea Batusha and Frasher Krasniqi went on trial for the attack, but another alleged perpetrator, Astrit Dehari, died in a detention centre in Prizren on November 2016 – an incident that sparked protests. 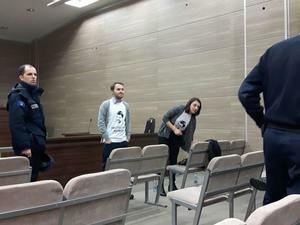 The four activists on trial wore T-shirts with the slogan “Justice for Astrit” at Wednesday’s hearing. Commander of Montenegro’s Special Anti-Terrorist Unit, SAJ, Radosav Ljeskvic, was sentenced to five months in prison for torture and using excessive force against protesters at an anti-government rally held in October 2015. Civil society activists and opposition parties called the judgement "shameful" and demanded the abolition of the controversial police unit which they consider to act as a private army of the ruling party in Montenegro. Police special forces. 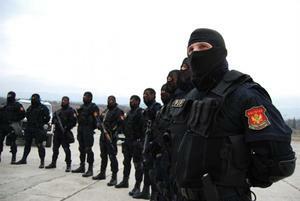 Photo: Montenegrin police. The first hearing in the trial against four activists from the Kosovo opposition Vetevendosje [Self- Determination] party, who are charged with attacking parliament by throwing an explosive device at the building in August 2016, has been halted after the defendants’ lawyers and the prosecutors got into a heated debate. Lawyer Ramiz Krasniqi, who is defending activist Atdhe Arifi, demanded that the prosecutor Abdurrahim Islami and the Special Prosecution be dismissed, claiming that the trial would be one-sided if they were not. The trial at the Basic Court in Pristina will continue after it decides upon the lawyer’s request. The parents of Astrit Dehari, who was one of the alleged perpetrators but died in prison in the Kosovo town of Prizren in November 2016, were present at the court hearing. At its last meeting before Bulgaria’s President, Rumen Radev, appoints a new caretaker government, the outgoing cabinet, led by GERB’s head Boyko Borissov, raised the minimum salary in the country by 9.5 per cent on an annual basis, taking it to 460 leva (around 230) euros per month. Despite the rise, the minimum salary in Bulgaria remains the lowest in the EU, where the minimum wage between different member states varies, with the Luxembourg offering the highest sum – nearly 2,000 euros per month. 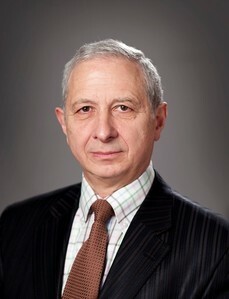 Borissov’s cabinet will remain in office until Friday, when Radev will officially announce the team in his interim government, which will be led by law professor and former President of the National Assembly, Ognyan Gerdjikov. 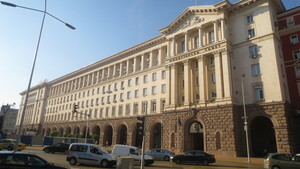 The new administration of the Bulgarian Presidency is closing its Twitter account, it announced on Wednesday. In a tweet sent from the account informing followers of the news, it was recommended that people address the official press service of the institution in the future. This provoked a wave of questions and comments on Twitter which remain unanswered at present. The @BgPresidency account won't be available anymore. For more information please contact the President Press Secretary's Office. Several hundred migrants held a protest in central Belgrade on Wednesday brandishing banners urging Europe to reopen its borders, the Associated Press reported. The migrants rallied in freezing conditions near the central train station outside the abandoned barracks which hundreds of men and boys have been using as a makeshift shelter for months. One protester, Ahmed Osmani from Afghanistan, said that the migrants “want the border [to] open because 90 per cent of people that are here are all sick," Associated Press reported. According to Serbia's Refugees Commissariat, around 1,500 people are currently living in the barracks. One person has been killed and four others hospitalised as a result of two pileups on icy roads near the Serbian capital of Belgrade on Wednesday, the Associated Press reported. According to reports from N1 television network, around 25 cars were involved in the pileups, which blocked a key road leading north of the capital for a few hours. In recent weeks, Serbia has been experienced extreme winter weather, with icebreakers needing to be brought in from Hungary to assist with breaking through the ‘ice jams’ that had formed along parts of the Danube river running through the country. Kosovo President Hashim Thaci said that a wall erected by the Serb authorities near the bridge that divides the northern town of Mitrovica must be removed or the state authorities must act on a parliamentary resolution to remove it by the end of January. Thaci said that “the best solution” would be if the wall was removed by those who built it, but parliament’s will must be respected. Speaking at a press conference after returning from a meeting in Brussels between the presidents and prime ministers of Kosovo and Serbia, Thaci said the main aim of Tuesday’s meeting - to reduce tensions and prevent provocations - had been achieved. “We will keep our commitment and I hope for the same from the Belgrade side,” he said. Students and activists who participated in the overthrow of Albania's brutal communist regime 26 years ago are coming together to demand political changes once again. Read more. Fears of the growth in Islamic influence in Bosnian life have been augmented after Sarajevo University Senate advised faculties to let students to take a break on Friday for prayers. Read more. Female MPs in the Kosovo parliament have created a cross-party organisation to work for women’s rights and combat discrimination, but progress is slow and some male lawmakers have been critical. Read more. The Albanian party for Justice, Integration and Unity, PDIU, which represents the country’s so-called “Cham” community, is demanding parliament forms an ad hoc commission to investigate the “Cham tragedy”. The PDIU’s request was not supported by other political parties to be included in the parliamentary agenda during the next three weeks, but discussions on whether it will make it to the agenda at a later time have been postponed until next week. The Chams are ethnic Albanians who were expelled from Greece at the end of the Second World War for having allegedly collaborated with the Italian and German occupation forces, while many people in Albania believe that the community were victims of a Greek genocide. In Banja Luka, the administrative centre of the Bosnian Serb entity Republika Srpska, a meeting was held this morning between a delegation of RS President Milorad Dodik's party, the SNSD, and the Croatian party HDZ, led by Dragan Covic. The main topic was a new draft law on the Constitutional Court of Bosnia and Herzegovina; Dodik has insisted that international judges should no longer sit in the court, and Dodik and Covic earlier agreed that the SNSD and HDZ would propose amendments to the court accordingly. Dodik said after the meeting that cooperation was close between the two parties, and voiced concern about equality of representation in the Federation House of Peoples - also a concern of Covic's. Forty-four women from Kosovo have joined violent extremists groups in the conflicts in Syria and Iraq, according to a new report by the Kosovo Center for Security Studies published on Thursday. 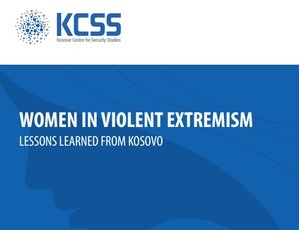 According to the report, titled ‘Women in Violent Extremism - Lessons Learned from Kosovo’, this number is second only to Bosnia and Herzegovina, from where 60 women are reported to have joined the conflicts in Syria and Iraq. Ideological factors, socio–economic factors and personal motives are named in the report as the main reasons that drive women from Kosovo to join the conflicts in the Middle East. However, the report also states that women from Kosovo were not active participants in the violent extremist organisations operating in the region as they were not allowed to do so, or to carry arms. 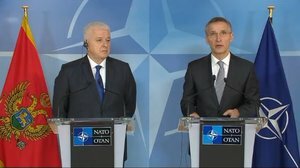 Montenegro's NATO membership will send a strong signal of commitment to regional security, secretary general Jens Stoltenberg said on Thursday, amid growing Western concern about Russian influence in the Balkans, AFP reported. 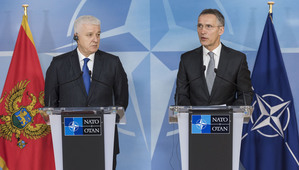 "Your NATO membership will send a clear signal of stability and security in the whole region, which is the basis for prosperity," Stoltenberg told Montenegro Prime Minister Dusko Markovic at the alliance's headquarters in Brussels. 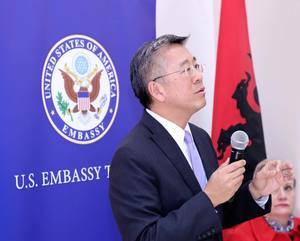 The US embassy in Tirana announced on Thursday afternoon that they have revoked the non-immigrant visas of several Albanian judges and prosecutors, after determining that the officials no longer meet the qualifications required. “The U.S. Embassy took this action in advance of the upcoming vetting process that will assess certain officials’ ties to corruption and in response to a case involving the flagrant abuse of an official visa by a senior prosecutor and his spouse, leading to a revocation of their visas," the statement from the embassy reads. The names of those who have had their visas revoked were not revealed. The new cabinet led by Ognyan Gerdjikov, the former speaker of parliament, will be in charge of organising early elections and preparing Bulgaria’s 2018 EU Presidency. Read more. State institutions and individuals have started applying for access to information kept confidential in secret police files for more than 25 years after the Albanian Communist regime fell. Read more. Proposed legislation that would pardon convicted politicians or reduce their jail terms is widely seen as an attempt to undermine Romania's campaign to stamp out corruption. Read more. Macedonia’s junior ruling Democratic Union for Integration, DUI, is expected to make a key decision on whether to renew its former government alliance with former Prime Minister Nikola Gruevski at a party leadership sessions scheduled for Friday evening. DUI's decision will likely determine whether Gruevski's embattled VMRO DPMNE party will stay in power after the near-tie result at the December 11 elections, or open a door for a possible government led by the opposition Social Democrats, SDSM. One of DUI's vice presidents, Teuta Arifi, told Telma TV on Thursday that negotiations between DUI and VMRO DPMNE have not been smooth and that there is an "internal debate" inside DUI over which path to choose. Arifi also stated that her party values the EU’s calls for the formation of a credible government that would boost the reforms urged by Brussels. She also condemned the so-called "de-Soros-isation" of Macedonia, which was recently announced by Gruevski himself, adding that the DUI has nothing against the Foundation Open Society - Macedonia, funded by US billionaire George Soros, who Gruevski accused of working against Macedonia's interests. Bulgaria’s President Rumen Radev and interim Prime Minister Ognyan Gerdjikov announced on Friday that the key missions of Bulgaria’s newly appointed caretaker government are organising fair elections, guaranteeing stability until the next elected government comes into office and preparing Bulgaria’s 2018 EU Presidency. The 20-member team of the new cabinet was presented by the President, who called on the ministers to remain non-partisan. At the same time, he ordered the cabinet to review the government of Boyko Borissov and to bring to attention any irregularities that are identified. Ambassador of Bosnia and Herzegovina to Australia, Bakir Sadovic, and the newly appointed Honorary Consul of Bosnia and Herzegovina for the region of New South Wales, Djemila Gabriel, today opened Bosnia's new Honorary Consulate in Sydney. After a short ceremony at the premises in the centre of Sydney, Sadovic and Gabriel presented an exhibition of photographs. Prime Minister of Republika Srpska Zeljka Cvijanovic will attend a prosecution hearing on February 8, reports news agency Srna. Cvijanovic will attend in connection with the referendum in the Bosnian Serb entity that went ahead in September despite being banned by the Constitutional Court. The prohibited plebiscite asked citizens of RS whether or not they supported holding a public holiday on January 9, known as Day of RS. 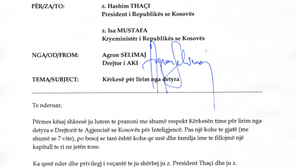 The head of Kosovo Intelligence Agency, Agron Selimaj, resigned from his post on Friday. Selimaj sent his official letter of resignation to President Hashim Thaci and Prime Minister Isa Mustafa in which he wrote that, “after a long time I believe that now is the time for me and my family to start a new chapter in our lives”. 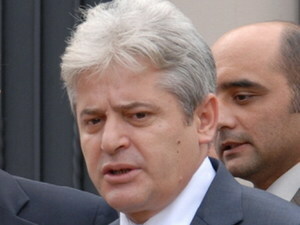 Selimaj was appointed head of the Kosovo Intelligence Agency in 2015.